Nothing to report for this day really… a midday flight meant we had to braves peak hour on the trains with all our bags and make our way to Narita. Thankfully the congestion was not too bad and a fairly uneventful ride out to the airport went with ease. We checked in, using the small Terminal 3 and with just a very slight delay we were in the air. 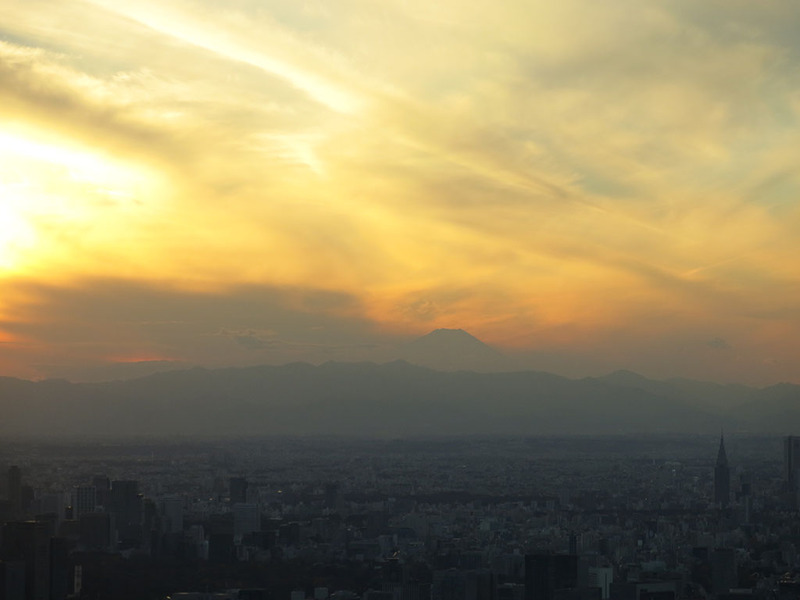 As we left Tokyo we could see Mt Fuji quite clearly, and that was my parting image of Japan. Fitting really. So how was our trip? Amazing. Yes, it was my 3rd visit and I visit many of the same places, but it was my first with Kate and then we had the craziness of Tokyo with Mads and also Craig and Erin. So it made it a very different experience, and I say the more people you are with in Tokyo maybe the better. We have an animated gif of myself, Kate, Mads and Erin dancing in front of the Robot Restaurant and that sums up a big part of the trip. Whirlwind craziness, encapsulating everything I love about Japan and its people. The best. Another day, another Shinkansen. Today was filling in a major gap in Kate’s Japan adventures, with a trip to Hiroshima. Given our tight schedule it was only to be a day trip, but with these awesome trains, it was certainly doable. So an early morning (7:20am) bullet train it was to jet us down there. We arrived regular as clockwork, at about 9am. There were. Two things on the radar… Miyajima Island, and the Peace Park and surrounds (well, two other things that I will get to too). Given we were at the train station, we decided to continue on to Miyajima to start our day proper. After arriving at the dock, we promptly jumped on a ferry and took the quick trip over. We were greeted with the famous torii gate just starting to get its feet wet as the tide started to rise, so sadly we were not gong to have a chance to wander to its base, but you have to be somewhat fortunate to be able to do that and get the classic view, so that was cool. fire! the perfect ingredient for any oyster. On arriving on shore, we proceeded to wander along the shore and the. Amongst the small stores dotting the island. Already there was a quite a few people wandering around, especially school kids. I took no time in getting some oyster action to get acquainted with the island, a couple of oysters “gratin” style, which ultimately was an oyster mac and cheese. Mmmmmm. Not bad for 10am. Kate started eyeballing the Hiroshima specialty cakey treats… so this was definitely going to be a day of food. From a vantage point, with deer keeping us company we could see the torii gate in its glory, with the water slowly creeping up. Selfies were difficult but we gave it a good crack. Mt Misen loomed over us so we thought we’ll give you a crack and started our way up. When I say crack, we had no intention of walking the whole way up (time being the main issue) so rode the rope way up most the way. Kate loves a good funicular so was loving the gentle sway as we made our way up. There was a not insignificant 30 min walk left at the top, and with that we made our way to over 500m and looked out over Miyajima and Hiroshima, as well as the bay. We had another glorious day… winter was treating us well. We soaked up the views and then legged it back to the rope way station. Time was zipping away, so with a stop for cakey treats, we bid farewell to Miyajima. So much fun in the sunshine. With Mt Misen conquered and our bellies filled, we jumped back on a ferry and then a tram back into the city. Our stop was the A-Bomb dome at the edge of the Peace Park. This building is pretty amazing, seeing what remained and what was destroyed when the bomb went off all those decades ago. Even though I had seen it before, it doesn’t fail to send chills down the spine. We then spent the next while wandering the park, seeing the monuments, thousands of paper cranes, as well as the Hypocentre. With just a little time remaining, we decided to pop into the museum. Much of it is closed for renovations sadly. The part that was closed was the first half, detailing the period of time up to the bomb falling. This was a shame as this part is super interesting, and it also meant we went straight into the horror of the bomb and its aftermath. It’s pretty heavy going in there. You see lots of artefacts that were charred and scarred when the bomb fell as well as a lot of gruesome stories and images of the human toll, especially children. Hard to stomach, but important stories that deserve to be told. The museum was closing as we left and wandered back through the city toward the train station. As we were just leaving the museum, I remarked to Kate that I was surprised we had not really had any conversations with random strangers or children looking to practice their english. Only 30 seconds later we were approached by a sweet group of school children wanting to do just that. One girl was clearly either the most confident, or the elected spokesperson, and got out her list of questions and asked us about all kinds of things… what did we like most about Japan, what did we like to eat, what words did we know. They loved that I talked about Ghibli, Pokemon, and Okonomiyaki. They also loved my Kangaroo impersonation. They were so sweet they wanted a photo with us, and I just had to get one as well. Thing #9234 I love about Japan. We still had two more things to do. The first? Okonomiyaki! Hiroshima okonomiyaki is not like its regular veggie pancake bro, this one is layers of thin pancake base, lots of cabbage and bean shoots and in mine soba noodles, bacon, and seafood. For me to get my fill we went to the main okonomiyaki area called Okonomi-mura, a building of 4 floors of small okonomiyaki vendors. Choose one, sit at the grill, and let someone cook you up a storm. Heaven. Kate and I chose early and sat down to be greeted with an eager woman ready to cook us up some dinner and pull me beer. I went with her special that had lots of seafood in there as well as the soba noodles, while Kate opted for the simple version with udon. We watched as she prepared and then I dove right in at the earliest chance. Oh man, I have dreamed of these okonomiyaki for the last 6 years since I was last here. This is the best way to eat it.